Bicycle Repair Forums - BikeRide › Maintenance & Repair › Frame & Forks › Flux Core Welder question? I was looking at a flux core welder at my local Canadian Tire store and it says its good for up to 3mm (1/8") thick metal. Would this be good enough for welding up your ordinary bike frames? Been researching the build your own recumbent info...out of castaway bikes. One person has used the braising method of welding his frames together, not really sure how much easier or better this method would be. Currently, I know nothing of welding, but have always wanted to jump in and learn some of it, for it would be quite handy to know. So will either be starting with the flux core welder or oxy/acetylene method. I'm no expert on welding and I don't know anything about "flux core welders". I do know though that if you don't weld/braze/solder a frame properly then you are likely to end up with very weak joints/tubes. Brazing is a lower temperature operation than welding. Besides the "normal" welding we now have MIG & TIG welding which has allowed all sorts of metals to be fashioned into good frames. These have allowed a much better localised heated joint and therefore have less effect on the tubing. There has also been steels developed specifically for welding processes which have better heat properties. With some training and research, I don't see why you couldn't build your own frame. There are hundreds of people building frames by hand and they had to start somewhere. I found this site very interesting although, perhaps, not relevant to a recumbent? I used to do both for a living, silver soldering/brazing and welding. 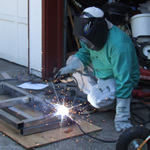 Welding involves actually melting the base metal, where as brazing or silver soldering is done at a lower temperature and the tubes never get hot enough to liquify, and is more like "gluing" a frame with another metal, than mixing the base metal and filler together. If you weld, the kind of welder you want is called a "TIG (tungsten inert gas) welder". I suppose you could weld a frame with a MIG welder, but IMO you don't have the control you need to weld something like a bike frame. TIG welders are the ultimate, enabling you to control both rate of feed of the filler metal and heat independently. And a good craftsman can make some very beautiful looking welds. These welders can be very costly though. I heard that MIG welding is only good if you are located in a place where you can be shielded from any stray breezes that would ruin the gas shielding, and that is where the flux core welders are better (outdoor conditions etc). Same concept as the MIG, but has a wire that has the flux core, so don't need the shielding gas. Oxy/Acet being able to provide you with the cutting option as well as being able to heat up parts of the tubes to aid in bending etc., makes me lean towards going this route. On the other hand, flux core offers a simpler set up. No tanks to have to worry about, just have to clean up the joints a bit, for apparently they are messy due to the flux spatter. Blade, I've never used a flux core welder, but I'm assuming that the "flux" actually burns to produce the same end effect, that is to produce an micro environment condusive to welding much the same that the gas provides with TIG. That being said, I think any breeze would also be detrimental to the quality of the weld. I just don't think MIG of any kind is good for welding bike frames. Because you need to have a lot of control of the rate of feed of the filler metal AND the heat independently, I think TIG is the only way to go if you decide to weld rather than braze to achieve the required strength of each joint. Even though brazing and welding are quite different, this is where they both offer the same in what is required to make a good, strong, clean connection between tubes: a slow, controlled approach. I silver soldered a few frames myself many years ago (under the supervision of someone who really knew what they were doing). However, that technique requires lugs, and I don't know if any lugs are manufactured or available in the dimensions (angles and sizes) required for a recumbent design. Because brass fillets allow you to design any kind of angle into the frame, this construction technique lens itself very well to non-standard frame dimensions. So if I were ever to attempt to build a recumbent, I would probably try the brazing technique. This would allow you to take your time with each joint, and even finish them off real nice with filing and sanding the bronze afterwards. Blade, flux-core welders are cheap and meant for the home hobby work and not much else. In my opinion they are a waste of money, anything that uses standard household wiring (115v). A high-end 220v ($800+) MIG welder would be better for the thin metal of a bicycle frame, however, this is still not an easy task to learn in order to feel safe using your welded object. A TIG welder (220v) would be more appropriate for bicycle tubing and several manufacturers brag about using "quality TIG welded" frames. However, the typical TIG welder costs more than $1000 minimum and takes much more knowledge of its usage. Oxy/Ace is too hot for bike frames. I have thought about building frames using a MAPP torch ($60) type of brazing. It is hotter than a Propane torch, but not as hot as Oxy/Acet welding. I might even re-do some old brazed frame lugs with it. But that is the only type of frame building I personally would recommend unless you are a master weldor. I wouldn't even recommend allowing someone weld on a frame unless I was absolutely sure of their qualifications. Then there are many frame manufacturers that sell frames for just $100. You can't even build one yourself that cheap. Blade, the photos below show what a master weldor can do with a TIG welder (aluminum cans and razor blades). That's heat control. When you can do that, then you will have a better vocation than building a bike frame. Steve, I've welded some rather thin metal in the days I was a welder, and I carried a lot of pride in the integrity and cleanliness of my welds. I found TIG welding to be outright fun, with the flexibility one has to let one's creativity run wild. But I have to commend you, sir, on the welding of those aluminum cans. Knowing how difficult welding thin aluminum can be, your work in that picture is TOP NOTCH! (04-04-2010, 11:18 PM)marathon marke Wrote: Steve, . . . But I have to commend you, sir, on the welding of those aluminum cans. Knowing how difficult welding thin aluminum can be, your work in that picture is TOP NOTCH! Sorry to mislead you Marke, it isn't my work. I'm far from a master welder. I meant to say that "I would use a MAPP torch on a bicycle." The photos were meant to show what a master welder can do, not me. I currently own a Miller Thunderbolt XL AC/DC stick welder and the thinnest stuff I can do with that machine is 20-gauge sheet metal . . . if I'm lucky. For those that don't know, a stick welder can be powered up to cut through 1/4" steel like butter if needed. Not exactly a bicycle tool. It is mainly used for thick metal because of its power, 1/8" (11-gauge) and thicker.